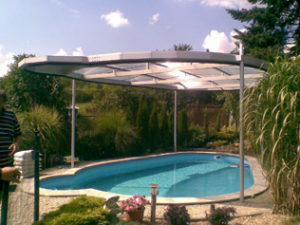 LOWO pool roofing is the unique system on the Czech market and manufactured in Germany. • safe for kids and animals thanks to bearing capacity 90 kg/m2. Opening and closing of the pool is the matter of seconds. 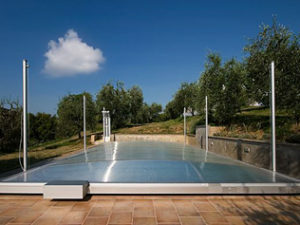 LOWO roofing system is remote controlled. You don’t have to bend, lift or move anything. 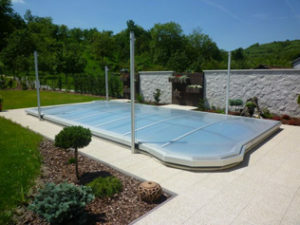 Just press the button and the pool roof lifts up to 2.5 metres above the pool. let me send you a couple of the latest photos. Everything is under snow, we have too much snow here, about 70-75 cm. Just the masts still stick out the snow. It’s great contrast of summer ease and winter peace. The roofing is really handy for winter. Best regards Z.H. from the foothills of Krkonoše. Once again thank you very much for smooth and quick construction; everything works just fine. We have to deal with tile finish to okay everything. Water has 39°C, it’s great. We wish you many successes. The water is 29°C now and clear like a crystal. The roofing is really unique, easy to operate, and elegant. I wrote the same to your colleagues in Germany. All rights reserved © 2015 LOWO.cz | Publishing of the website content without owner’s consent is prohibited.